We awoke this morning to find a grey sky which was the only reminder of the heavy rain during the night. Last night’s weather forecast was for an overcast morning with some showers and clearing by the afternoon. Leaving our mooring at 8.15am we cruised around the next bend to find the Black Prince hire boat which had passed us in the rain yesterday evening. At that time the crew looked rather miserable so we hope they all managed to cheer up after a good night’s sleep. 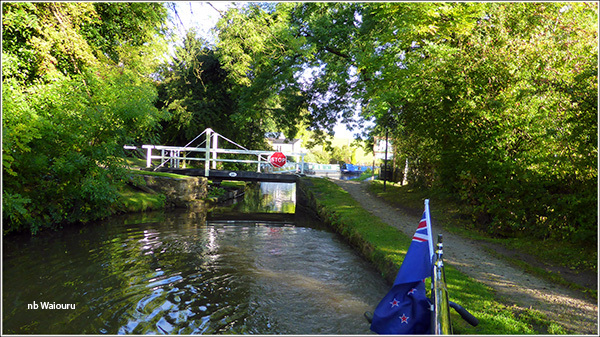 Today’s cruise didn’t have any locks, but there would be two lift bridges and two swing bridges. Jan covered all the bases by carrying a BW key, handcuff key and windlass. 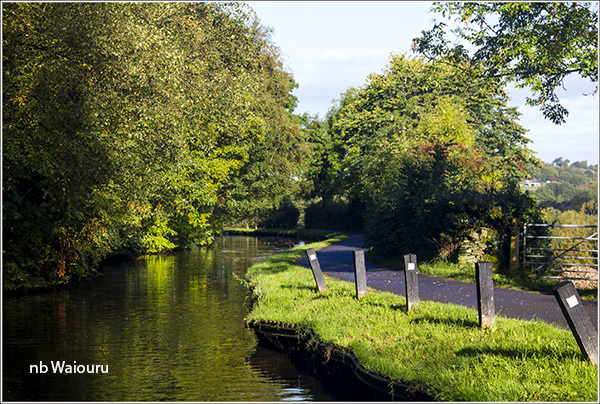 This part of the Peak Forest Canal runs on the 160m contour line on the southern side of the valley. 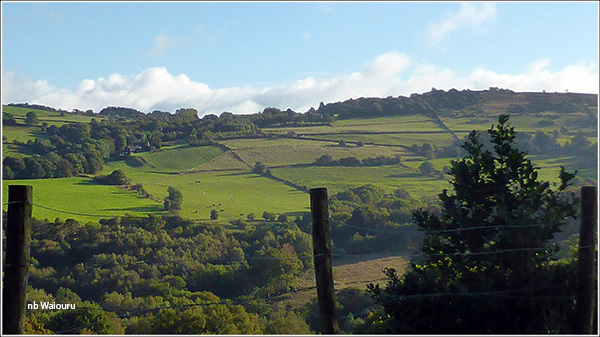 Below can be seen glimpses of the River Goyt, whilst there are great views across the valley to the north. Jan found all four bridges in good condition, although she did comment about the number of windlass turns it took to raise the lift bridges. Unfortunately she is going to have to do it all over again when we go back to Marple Junction. The canal appeared to be rather shallow in places. I was convinced we had something around the propeller and went down my favourite weed hatch to check on the washing only to find my new Tshirt had gone. It wasn’t until we reach New Mills that we met a boat going in the opposite direction. Another Black Prince boat which we fortunately met at a wide spot. Memories came flooding back as we passed the Swizzels Matlow factory. The smell of sherbert confectionery bought back childhood memories. Swizzels Matlow was originally based in London but moved to New Mills during The Blitz in WW2. I can’t find anything on their website about a factory outlet. When searching for information about the company I was amused to discover this website <I Live Here>. The comment about New Mills was both unflattering and amusing. There’s loads to do in New Mills if you’re a rabid child from the council esate who enjoys playing in one of the two s**t-diluted rivers or hanging outside the sweet factory for cast offs. So let’s get into what’s bad about New Mills. Everythin….wait, that’s not quite true. New Mills is a great place to live if you’re a chav. I kid you not. Let’s see what a typical ‘New Mills Lad’ as they like to call themselves likes to get up. first, dress up in your best white airmax shellsuit- quite fashionable here- your NYC baseball cap, and don’t forget that signiature touch, chewing gum. Now you’re good to go. The dole office doesn’t open till nine, so you’d better just sit at home watching Good Morning on your 54 inch mega screen TV that dominates your squalid council house living room wall. Some of the comments from readers of the article are almost as humorous. 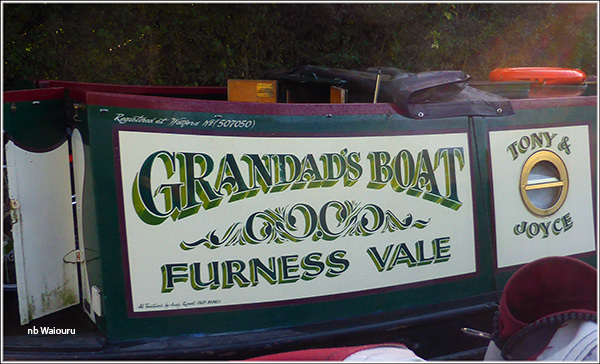 Jan took a photo of the following boat and was quite sure it had been named by the grandchildren. 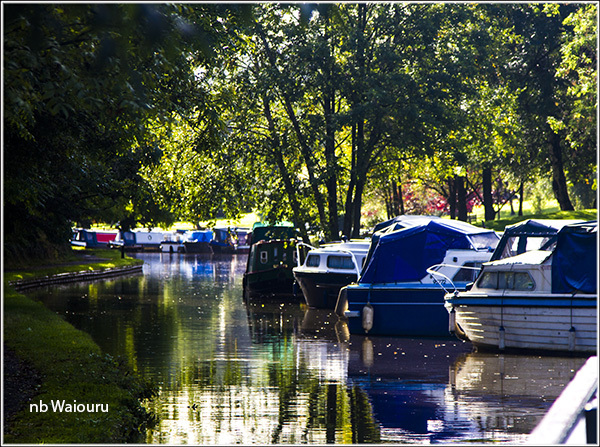 Furness Vale Marina appears to be very linear. From the canal there didn’t appear to be much in the way of a security fence and I wonder just how secure boats are? 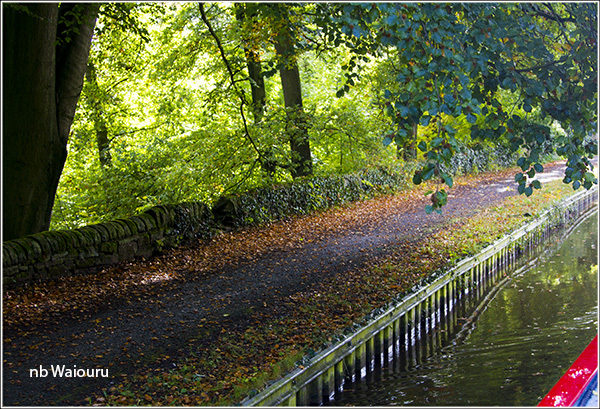 Autumn is obviously here with the towpath full of brown and golden leaves. It’s Jan’s favourite season (not the cold… the colours!). We were slowly approaching a blind bend on the approach to Greensdeep Bridge when the bow of a Black Prince hire boat appeared in the midst of doing the jump into hyperspace. The passengers in the front could see us but the steerer was around the corner out of sight. He received a hell of a surprise when he came into view and saw both his boat and ours on OUR side of the canal. Tiller over.. frantic reverse and eventually crashed into the towpath bank. Well that was the exciting part of the day done! Turning left at Whaley Bridge Branch Junction, we cruised down to Bugsworth Basin where we winded and reversed down one of the arms to moor. With little to eat for lunch aboard we walked back to the junction and crossed the canal via the footbridge to gain access to the adjacent Tesco. I subsequently noticed the branch to Bugsworth Basin goes over an aqueduct and there is a footpath under the canal which leads back up to the towpath. We used this route back as it avoided having to go up and down the footbridge steps. After lunch Jan did some cleaning inside whilst I washed a polished the cabin roof. The cabin sides are also desperately in need of a wash and polish. Maybe tomorrow….. Maybe! It's "Bugsworth" Basin(s) which were named after the town of Bugsworth. The townsfolk didn't like the "bug" bit and campaigned for a change of name to Buxworth - a complicated process as it had expanded to cross parish boundaries and both halves needed to agree the change. The basins are proud to retain their historical Bugsworth name. 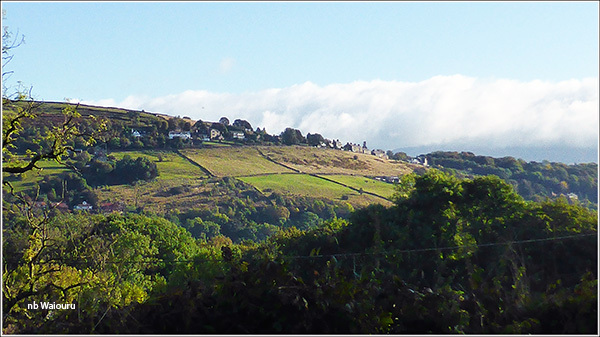 Make sure you visit Whaley Bridge on the way back out. It's not such a gem as Ripon and there's nothing much to do there, but you need to tick it off and say you've been there, even if it was only to check the map data. There's also a shopping opportunity near the junction where you can usually find enough room to moor for shopping, even if not overnight. I'd previously called it Bugsworth but when I examined your map I noticed the name was Buxworth. I thought I'd incorrectly heard the name! Corrected now.